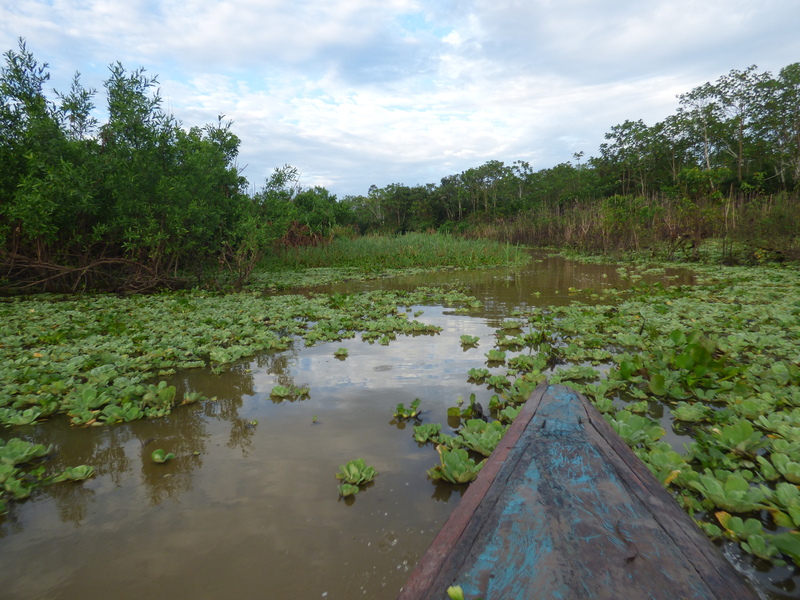 We were picked up at 8:30 am and taken by speedboat 2 hours up the Amazon River, deep in to the jungle. As we pulled up, there were two canoes on the shore, one filled halfway with water. I pointed at it and joked to Chase that I hoped that wasnt the boat we had to take anywhere. 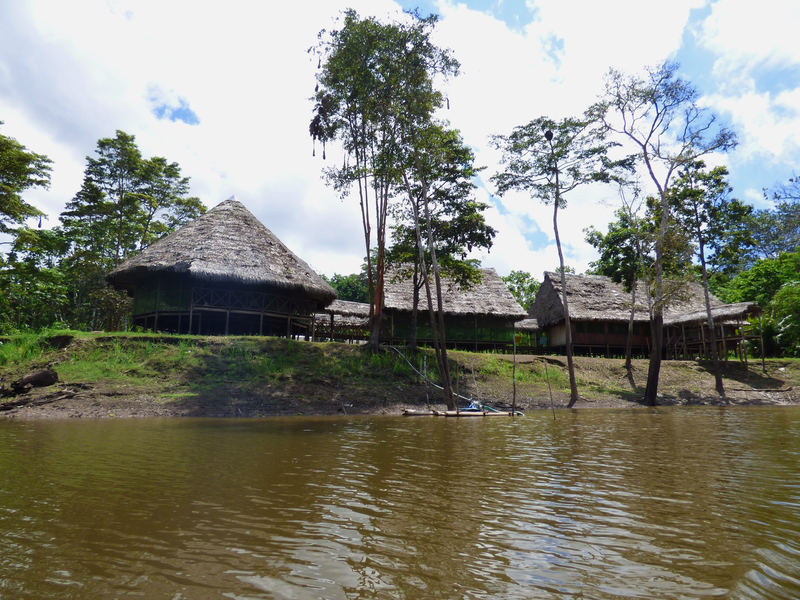 The lodge we stayed at was alone on its property, with the nearest homes (those of the local Shaman) about a kilometer away. Chase and I got a large bedroom, unlike any I have stayed in before. It had no windows, simply screens. It also had a screen ceiling that had a few holes, allowing our “roommates” to come and go as they please. About 20 feet above the screen ceiling was a tall tin roof that shielded all of us from the rain. The first roommate we discovered was a green tree frog. We named him Frank the Frog and welcomed him in to our life. 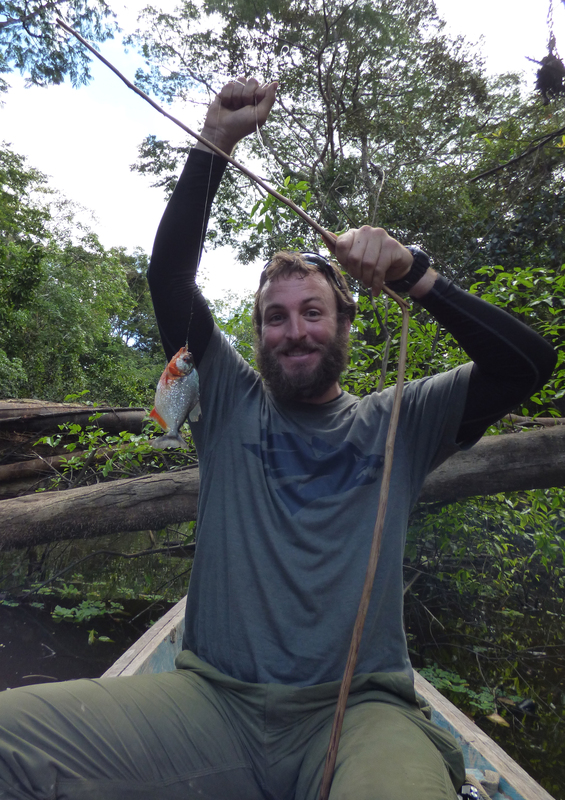 He seemed pretty harmless and gave me the impression that maybe the jungle wouldn’t be so bad after all… After dropping our packs, the day began with fishing, and the adventures began! A young boy sits on the river when we stop to fill up on gas. The lodge sits right on the river, with screens as windows and the local cat. Raul smiled and held up a plastic container. They used that container to bail the water out as we fish, and therefore we didn’t sink. The other couple we were with looked at Chase and I with wide eyes, and we all laughed nervously and hopped in. Lets hope the boat is sturdy, huh? We headed up river to a shaded area and were all handed our fishing poles. 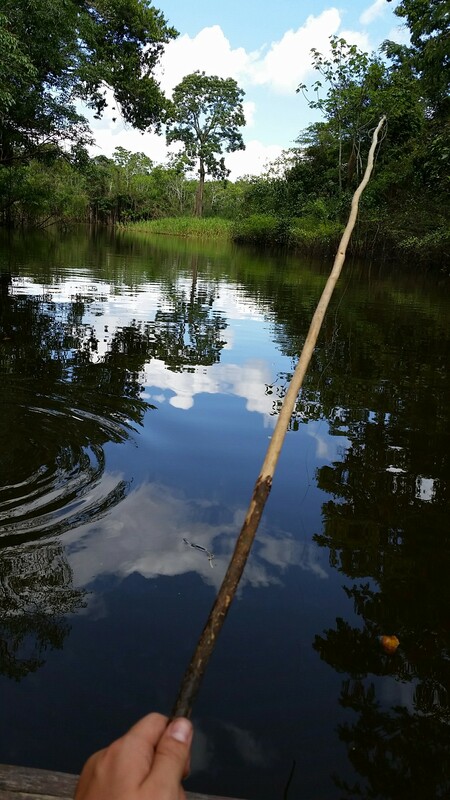 Now, this wasn’t the average fishing pole… It was a long piece of bamboo with a string tied around it. At the end of the string, there was a small barbed hook. No liters, no bobbers, no reels… This was the “reel” thing! Tee-hee, fish humor! The five of us slipped little bits of chicken on our hooks and began to fish. Within 2 minutes of fishing, I glanced over at my hand as I felt a small tickle. A spider bigger than any I have ever seen in the states was crawling across my hand! I let out a yelp of terror and brushed it off. While it should have fallen in the water, it instead FLEW off my hand, around a stick, and landed there with a little spider smirk. I swear that spider shot me a look that said, “Haha sucker, I win! You can’t throw me in to the river!” It was a terrifying spider to encounter for the first time in a rickety leaking boat. The theme continued with spiders and bugs making it their goal to come land on me and say hello. But let’s get back to the fishing, shall we…? At the moment we felt a small tug, it was vital to pull and hope to catch the fish. As I caught my first 3 fish, Raul told me we could use them as bait. The woman in front of me in the boat asked why I was going to kill the fish instead of letting Raul do it. As I told her that I had fished my entire life and had no problem killing the fish for bait, she hid her face so that she didn’t have to watch. I felt a little bit bad, but amused at the same time. However, I wanted the full experience! I smacked the fish against the boat and passed it up to Raul to be cut in to bait. I caught 5 fish that day: two piranhas, two catfish, and a sardine. 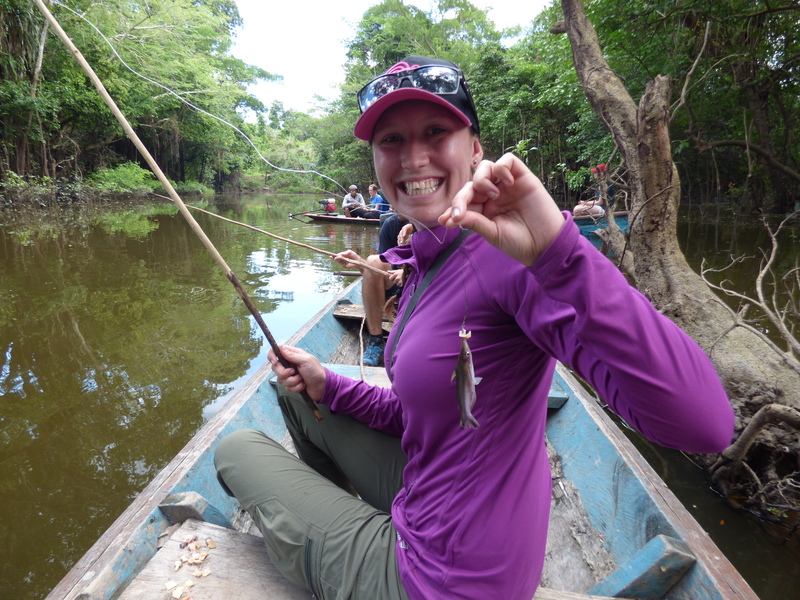 They were all fairly small, but I was thrilled to be catching fish the old fashioned way, and making my father proud! Chase also caught 3 fish, all piranhas. He caught 2 large piranhas that were edible, and also the biggest catches of the day! The second one was so large that it broke his fishing pole. Because of Chase, we had two large fish to bring back to camp and cook. I managed to catch a few little guys myself! Chase caught the biggest piranha of the day! 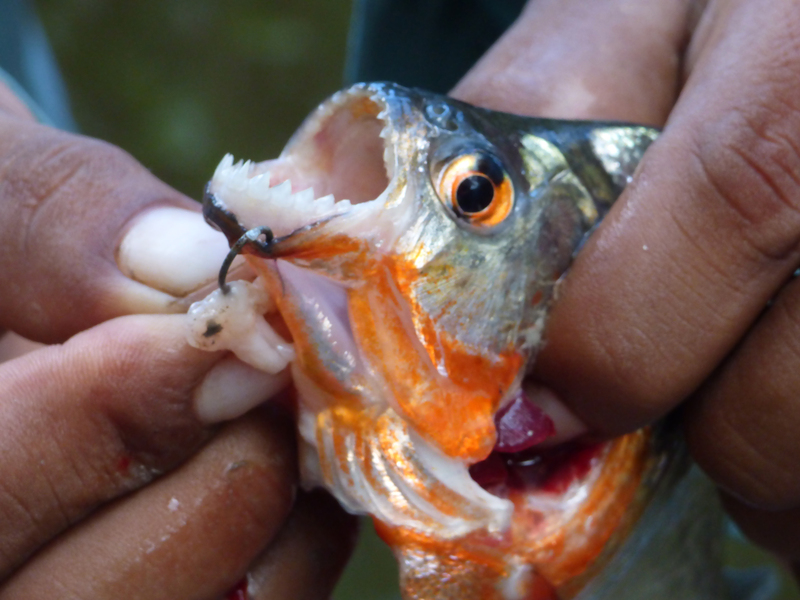 The rumor that a piranha can bite your finger right off rings true with this guy! We cooked them up back at camp to add in with our lunch. I ate very quickly so that I could seize a few moments to lay in the hammock and possibly nap. But, this is the jungle and not a moment of our time was to go to waste. Raul gathered us all up and in to the boat we went again. 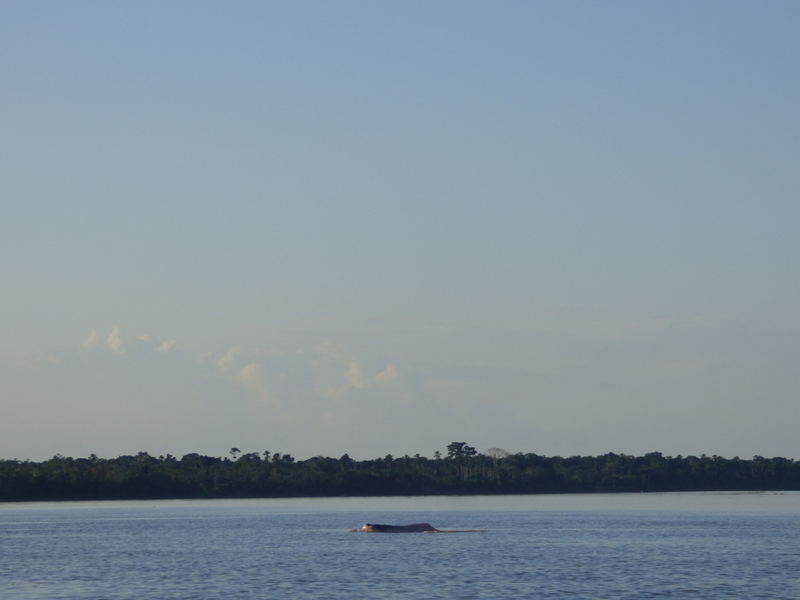 This time, he took us out to the main, wider area of the Amazon. He said the dolphins would be there and that we could jump in the water and swim with them. I asked if there were piranhas in this part of the river as well. He laughed and said yes, but that they wouldn’t hurt and they just nibbled as a person swims along. Now, I hated the thought of a piranha nibbling at my toes as I swan towards the dolphins, but I was not about to miss the chance to hang out with some pink dolphins! As I dove in to the water off the boat, I could feel terror envelop me with the cold water, waiting for the carnivorous piranhas to show up. After all, this is what they make movies about, right?! Everyone gets eaten by the anacondas or the piranhas! I felt a few things brush against my legs, but never any bites, and I soon got over my fear of being eaten. The dolphins were very curious and even swam as close as 20 yards to me as I swam out towards them. That moment hit me as I realized I was swimming through the piranha infested waters of the Amazon river, in the middle of the jungle, and with PINK DOLPHINS! Wowie! It kept a smile on my face all day. 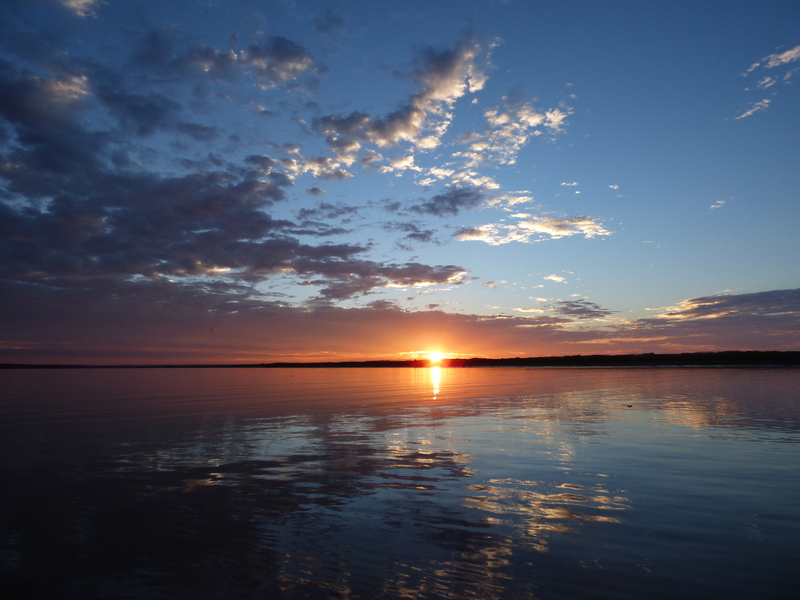 As we got back on the boat, we watched the sunset from the river. The dolphins jumped and played as the pinks and purples reflected on the water. It was silent, peaceful, and beautiful. Our first day in the jungle was quite the success. We got back to camp that night and I ran to our room to change. A large jungle rat crawled up the wall and through the hole in the ceiling. As it ran out, I discovered the fact that our only roommate wasn’t a tree frog. We also had a rat! I wondered what we would see next and left to return to dinner. Our group was made up of 2 couples. As a group of 4, we were very lucky to have such a small group during the high season. It also gave us the flexibility to choose what we wanted to do each day. We decided that night to save the night walk through the jungle for a different night and go to bed instead. We ended the day full of adventures and went to bed after a fantastic day. The only part that was a downfall was the fact that I don’t like the jungle. That night, I slept fairly well. I woke up 2-3 times feeling like I had bugs crawling all over me, but that was all fixed after I prayed myself to sleep. Thank goodness God isn’t afraid of bugs! Day two started with a bang! We were up at 5 and dressed and in the boat by 5:20. This morning was the morning that we got to watch the sunrise! As we floated down the river, the feeling of peace absolutely surrounded me. We sat in the water in silence, listening to the jungle wake up as the colors of the sunrise reflected and changed on the river. The younger dolphins were in our part of the river, so I watched as the played and practically performed for us, leaping in to the air in arcs and twists, about 30 yards away. As the sun passed over the horizon, the birds flew around and sang, and we saw at least 10 different types. Raul pointed them all out and their histories and what they did in the jungle. 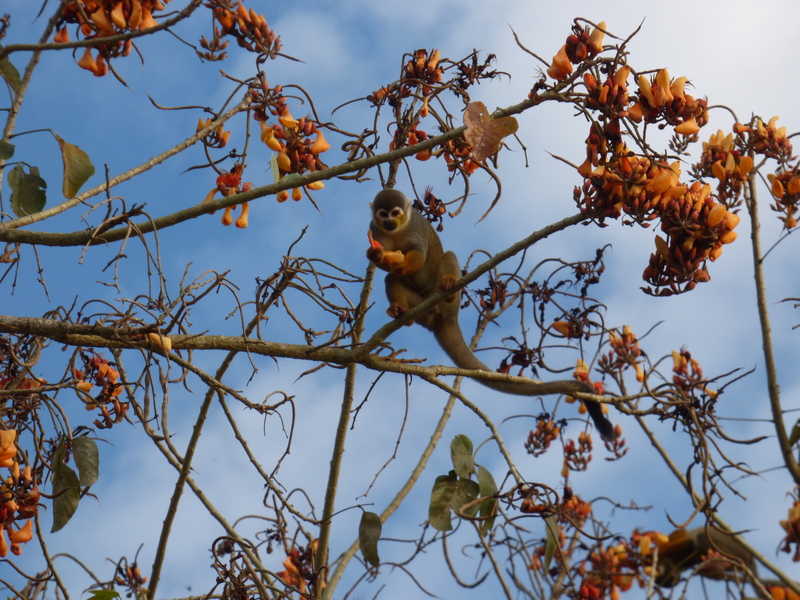 In the trees, the squirrel monkeys were eating like there was no tomorrow, jumping and flying from branch to branch, greedily shoving all they could fit in to their mouths. We sat, relaxing and watching nature for about two hours that morning before returning to the lodge. As I waited for breakfast, I sat on the wooden deck in a chair, watching the river and reading over a cup of coffee. It was the perfect moment, and my favorite part of the entire trip. I enjoyed the peace and semi-quiet immensely. The reason I say semi-quiet is that the jungle is never quiet, even at night. the bugs, frogs, and birds are a constant chatter. To me, it was like a lullaby and only added to the peace or to help me fall asleep. It was interesting to see how differently some people reacted to the noise. How many monkeys can you spot?! The day was starting out really well, and I was pretty happy with it. 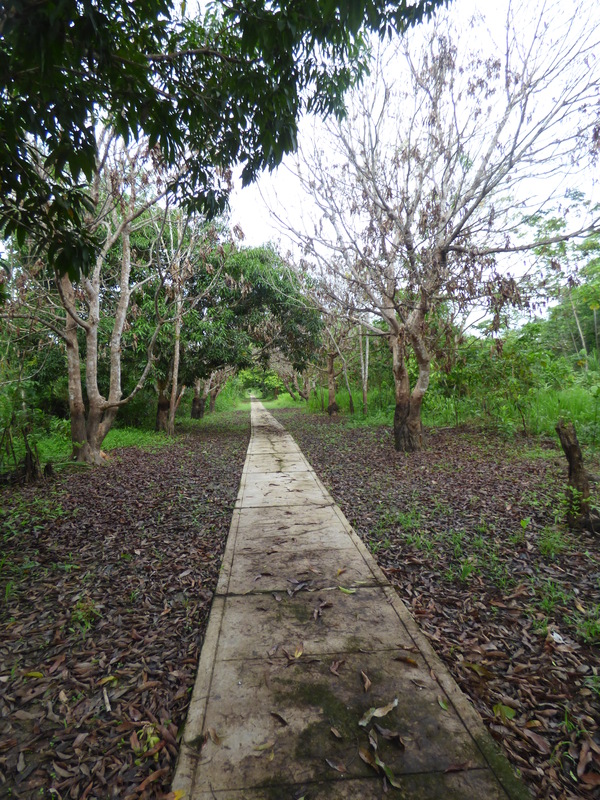 Then, however, we went on our 2.5 hour “jungle walk” looking for bugs, snakes, birds and sloths. At first, the walk was really fun! I asked Raul if I could swing on a vine like Tarzan and he found me a long one that let me swing at least 20 feet. It was so much fun! The trees all had really unique roots and the mud wasn’t too bad. After the first 20 minutes it changed. Our guide was a foot shorter than me and as he chopped his machete through the trees, creating a path, he did so for a 5 foot tall person. The jungle is not made for tall people! I was bent over most of the time, and the rest I was walking in to giant spider webs with a forced source of protein entering my mouth. Thorns grow on every branch and vine there, and constantly grabbed my clothes, hair, and skin. The mud came up almost to my knees, the bugs came in driving forces, and then the final blow hit me: carnivorous wasps. Why these little devil bugs exist, I am not sure. They are reddish in color, which is when I figured it out! God has angels, and Satan gets mosquitos and carnivorous wasps! I practically ran out of that section of the jungle. 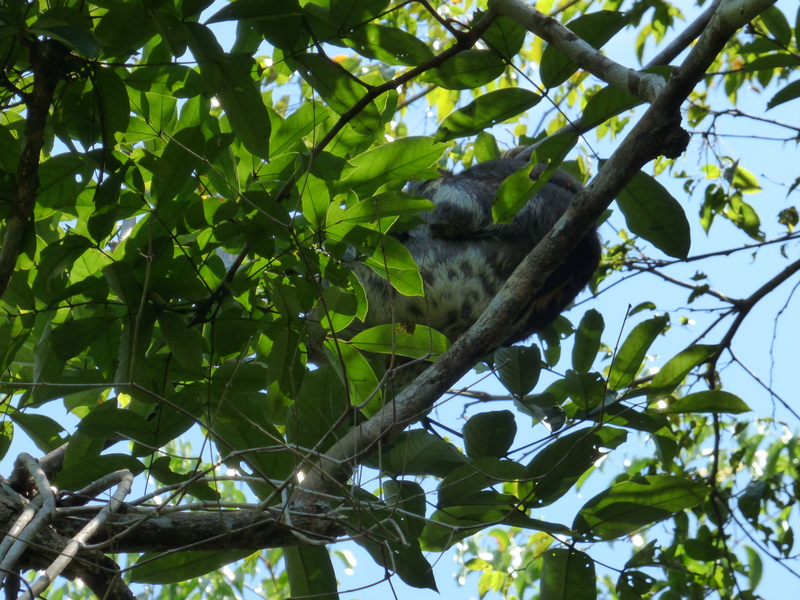 As we walked back towards the start, we did get to see 3 sloths and an iguana far up in the trees. It was my first time seeing a sloth and I was pretty happy to see one thing in the jungle that didn’t want to eat me. When we arrived back at the boat to head to camp, we were all sweaty and exhausted. Trekking 2 hours through mud that’s up to my knees was no easy business! 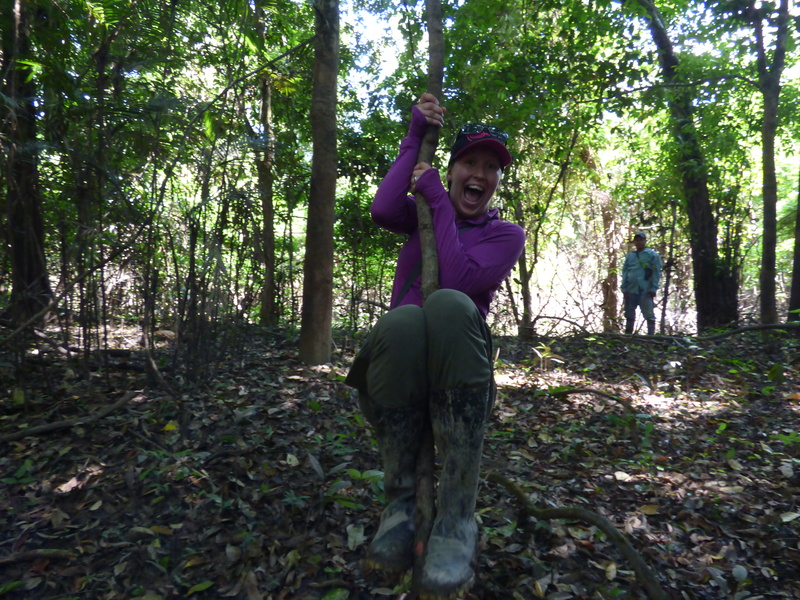 I got to swing on a real vine!!! After lunch, Raul announced that we were going on another jungle walk. The four of us looked at each other and said a unanimous no. We told Raul that we would rather relax in the hammocks and enjoy the peace of the day, and he happily obliged. He seriously was the nicest man that has ever guided us. That afternoon, we laid in the hammocks, talked with Raul about his life growing up in the Amazon, and relaxed. I immensely appreciated the afternoon of peace that we got. The remainder of our activities were put off in to the night. That evening after dinner, we put our bug spray on and headed out in to the boat. It was pitch black outside and the only light came from our headlamps. We tried to keep those off, however, since the bugs would swarm directly in our faces because of the light. We set off quietly down the river, looking for a red reflection to our headlamps. If the reflection was red instead of yellow, that meant crocodile eyes. The search was heart-pounding exciting! We would creep closer to where we spotted the croc, trying to see it up close. 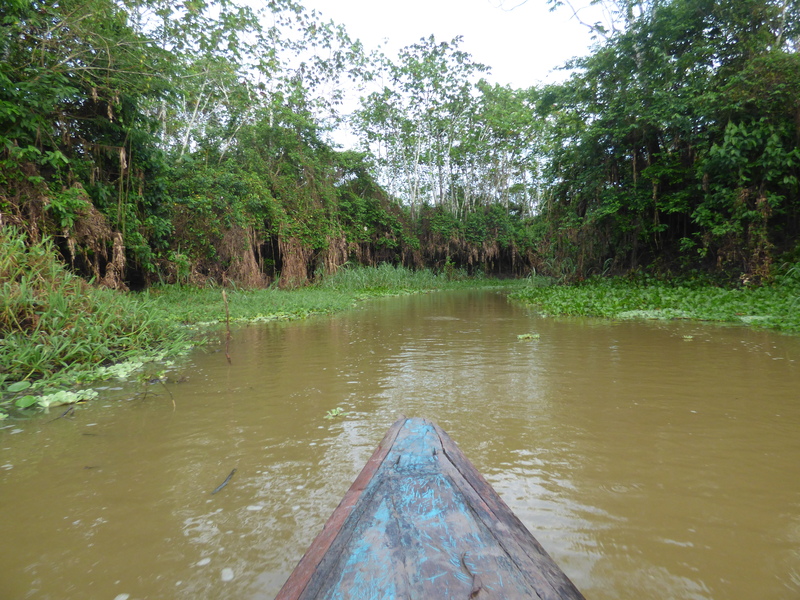 It was also slightly terrifying, knowing we were paddling straight in to the area with crocodiles underneath us in water that was only 2 meters deep. 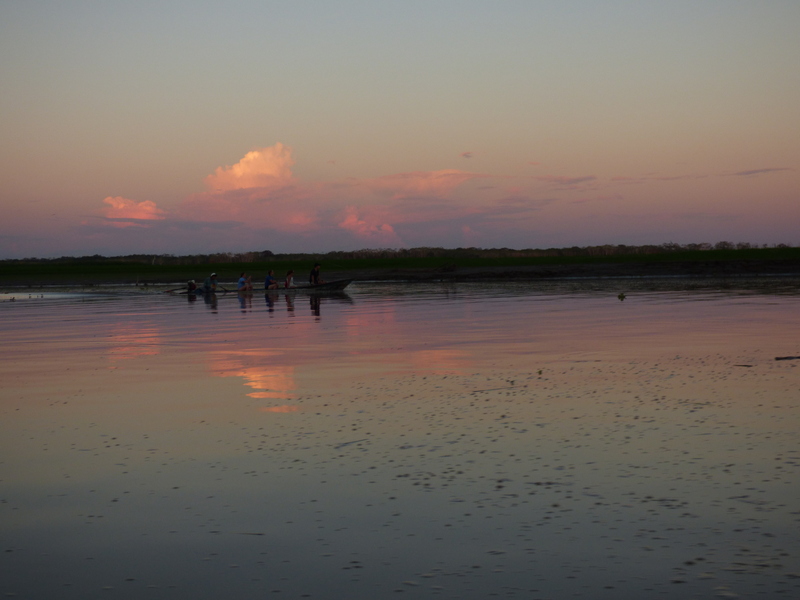 We spotted many crocodiles that night, and at one point, Raul leaned out of the boat and captured a baby crocodile! He passed it around for us to hold, and I truly got an up close and personal experience with the crocodile species. It was exhilarating! In addition to the crocodile spotting, the night was full of beauty. As we weaved down the river, the fireflies lit up the shores, blinking and twinkling like those pretty white Christmas lights. When all the flashlights were turned off, it was even more incredible! With the fireflies twinkling on shores, and a clear view of the sky, I saw more stars than I have ever seen in my life, including all of the remote places we have been on this trip. They were so bright, vivid, and clear! I saw space in a way I didn’t think possible with the human eye. Chase and I could see the different arms of the Milky Way Galaxy! I had heard of them, but never imagined being able to see them with my own eyes! It was a special experience for sure. It didn’t last long. A storm was rolling in to our east, with clouds and lightning flashing in front of my eyes. Since every direction from the river is flat, I sat and watched as the storm approached, closer and closer. Everytime the lightning struck, it lit up the sky and the area around us. I watched it for the entire boat ride back, waiting for it to hit our location. Within ten minutes of being back in the lodge, it did. The torrential downpour was unlike anything I have ever experienced, and AWESOME! The river changes as you travel down it. The different views and sights were amazing. As the rain came down, I shined the light around the room and saw a pair of beady eyes staring back at me. I realized that it was an ENORMOUS spider, about the size of my hand. It had just helped itself to live in our room, with the impression that we could all be best friends. As all of these spiders on the trip hung out in our shower and above the bed, I decided to give them a friendship, on my terms. As an offer of friendship, I sprayed them with 100% Deet spray and hit them with a shoe. The friendship was short lived as they twitched from the spray, and then completed with the smack of a shoe. Now, if someone doesn’t agree with my definition of friendship with a spider, I simply would tell them this: I am not going to sleep in bed knowing that a spider the size of my hand is crawling around in the same room. Period! Well, on to day three. It was my third morning in the jungle. I had too many bug bites to count, despite using 100% Deet bug spray, in all the wrong places. This was at the time, the itchiest day of my life. The rain was still coming down and the ground was completely flooded. I selfishly hoped that it would be too flooded for a jungle walk… 2 hours later, Raul walked in and announced that it wasn’t. To the jungle we go! This second jungle walk was quite different from the first. 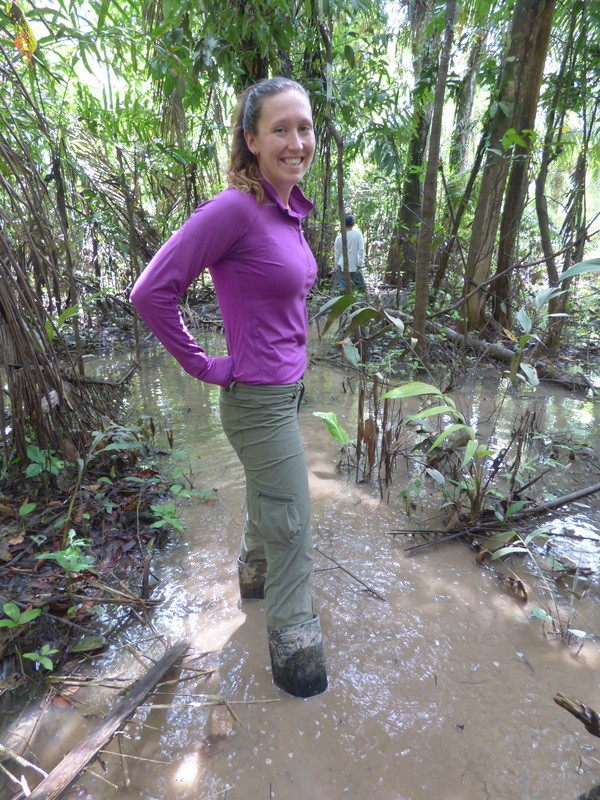 It was in a different area and we were primarily searching for anacondas. This meant walking through every pond, lake, and swamp we could find! 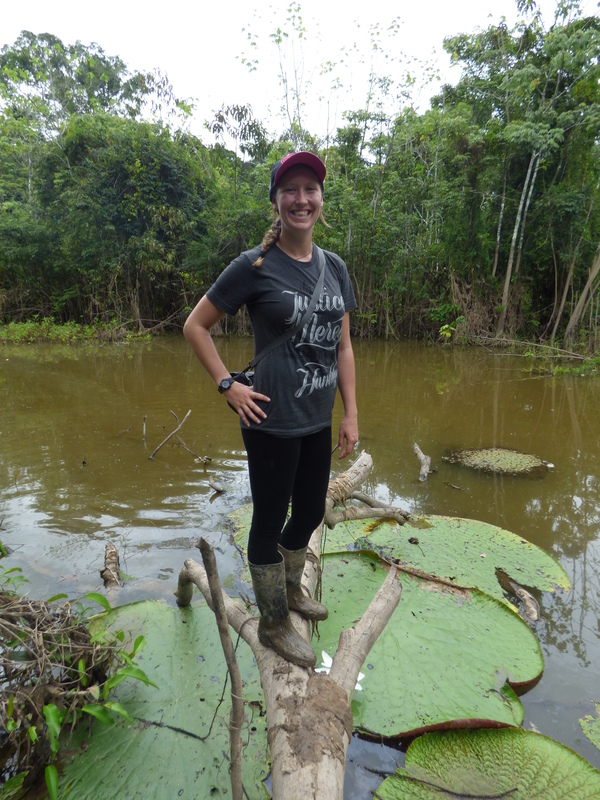 We trudged around for about 2.5 hours, and learned quite a bit about the plants and bugs since we didn’t find any anacondas. Termites are used as a natural bug repellent in the jungle. Aside from eating them, they are also rubbed around the body as a repellent. Raul demonstrated his and asked if anyone would like to try. I did not, but Chase was all for it! He pushed his finger in the nest, grabbed 10 termites, and licked them clean off his fingers! They have a minty flavor that didn’t make them so bad to eat! The termite nest was at least three feet long on the tree. Chase got a mosquito repellent AND a tasty treat when he ate these suckers! Next, we learned about the plant that Iowaska is made from and the process to make it. Iowaska is a tea made from the vines of the Iowaska plant to bring hallucinations and visions. It is used by the locals to “discover oneself” and confront their fears. Many people that we met, including tourists, had taken it to get the experience. 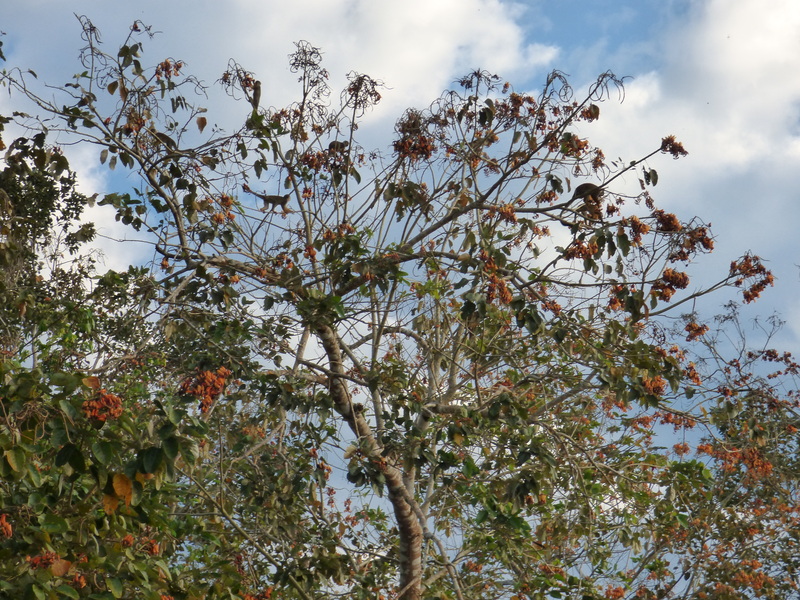 Aside from that plant, we saw millipedes, centipedes, more monkeys, a rubber tree, and the “chiki-chiki” tree. The “chiki-chiki” tree is where the natives used to come and “chiki-chiki” so that the tree would bless the baby when it was born.About 2 hours in, we reached the first dry surface we had seen. It was about 10 feet by 10 feet and spongy. We said that this must be a good place to camp, and Raul informed us that it was actually a leaf-eating ant nest. 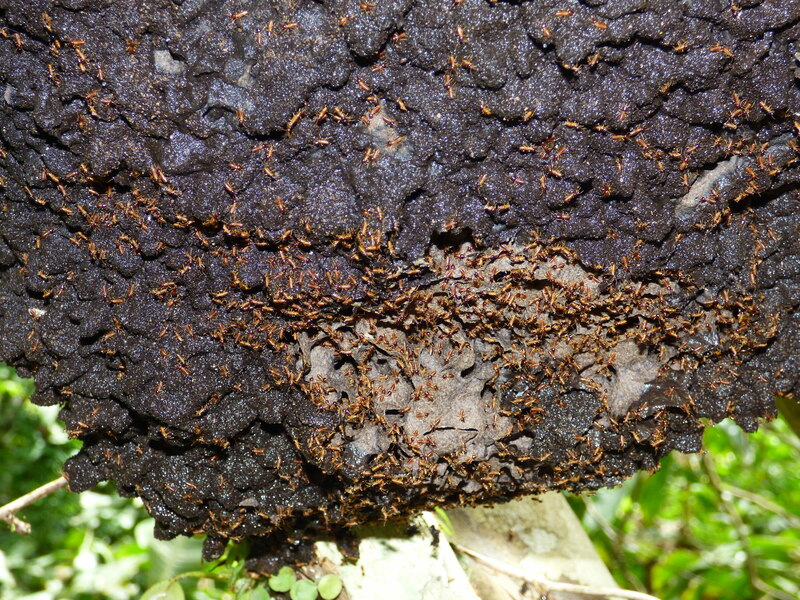 So, millions of ants were scurrying around just below our feet! After that, we were the ones scurrying away to get away from the nest. From there we finally went back to lunch. 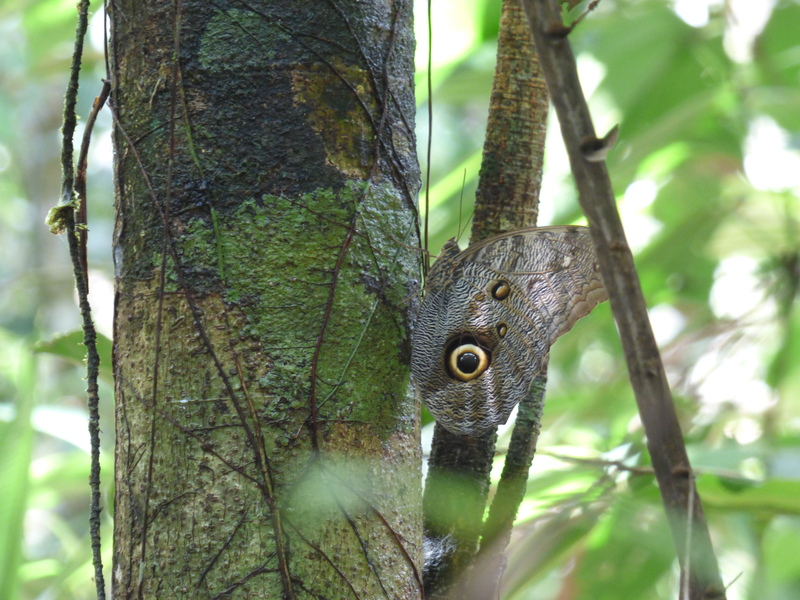 I found it rather odd that in 4 days of exploring the jungle, we didn’t see a single snake. The giant lily pads had the most beautiful flower growing on top! The remainder of the day was relaxing and spending time in the hammocks, as Raul had left to get more gas for the boats. We played guitar, sang, and had a regular fiesta with the locals that lived there, laughing and singing. We got great practice with our Spanish and enjoyed the day. That night, the boys went on a night walk through the jungle while the other woman, Miriam, and I stayed back. We played Uno late in to the night with the son of a guide and one of the cooks. They had never seen the card game before, so it was quite entertaining as they learned to play. That ended our third day in the jungle. I went back to the room to sleep, made “friends” with a few spiders, and went to bed. Day 4 was another early riser as we got up. 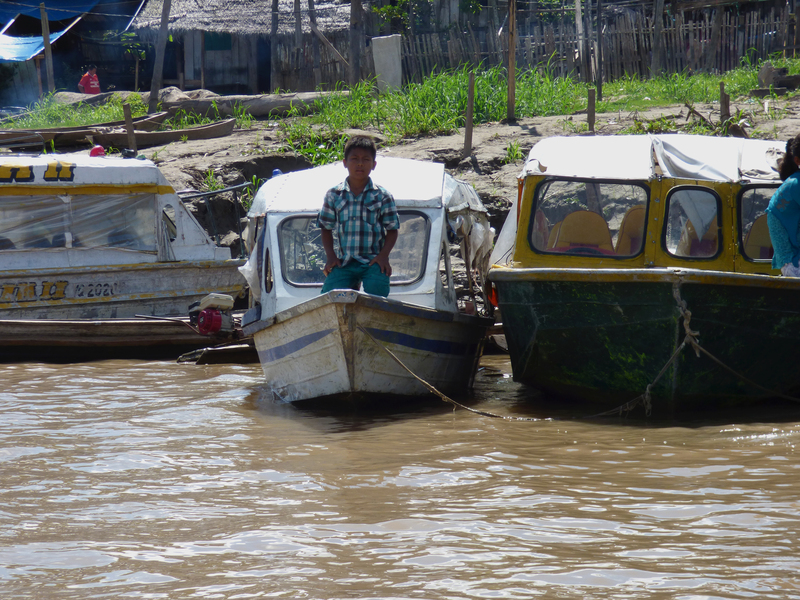 We hopped in the boat and set off for Raul’s village. It was down river and where he grew up. Here, we learned a lot of things about life in the Amazon that I never could have guessed. We arrived to see a straight line of sidewalk down the shore. This was created by the government for the ease of walking during the rainy season. 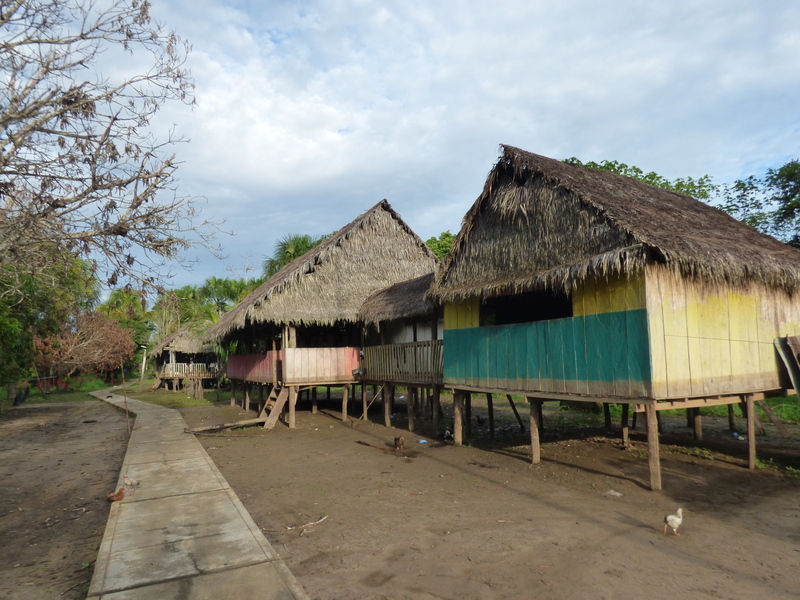 All of the homes were about 100 meters apart and on stilts at least 3 feet high, some higher than others. We stopped at the first house as Raul greeted his neighbors. I learned that the water rises about a foot above the floor during rainy season, and that the family lives on boards they put in the rafters for 3 months of the year, waiting for the water to lower again. In total, there were about 7 houses and a school. The town is about 2 kilometers long and not many people live there. This was also the village that Raul grew up in. Seeing the way that they lived was simply incredible, realizing the simple things they went without that I couldn’t fathom not having back home. The village that our guide grew up in. During the rainy season, the water level rises three feet above the floors! The school has three buildings, with one room each. This is for the three age groups of children. About 10 kids attend the school according to Raul. The rooms are dark and dusty, and appeared to be barely used. It was a vast opposite from any school I have ever seen. 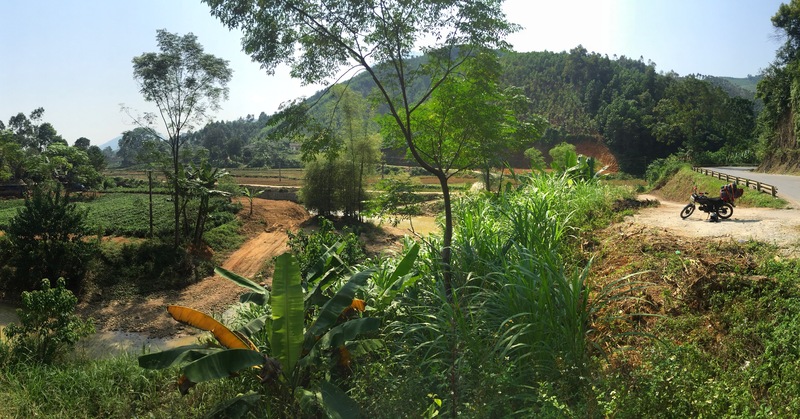 What an experience it was to meet the people of the village, see their homes, and walk the entire village. 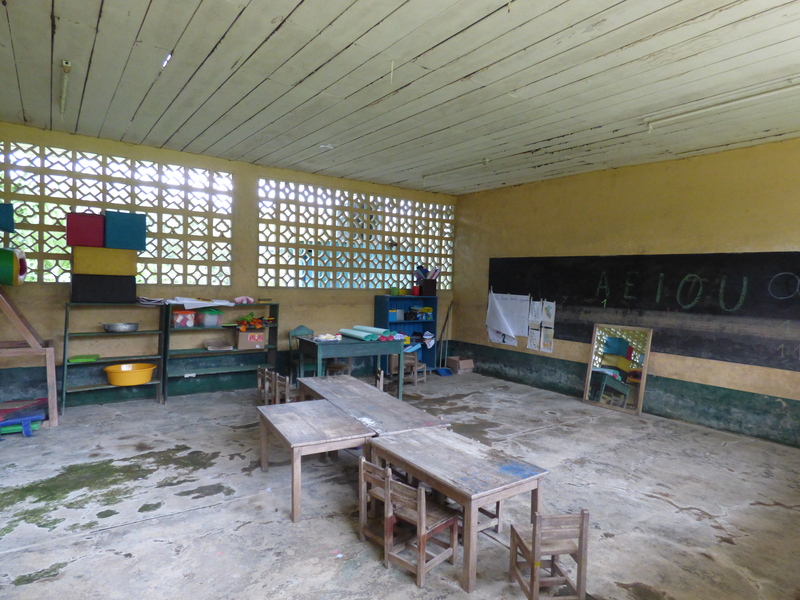 The schools for the village kids are closed often due to rain, flooding, or other reasons. When they do attend, there are three buildings for three age groups. That ends the 4 day journey we had exploring the jungles and rivers of the Amazon. The incredible sights, sounds, and animals were unrivalled. This is a special, unanticipated part of our journey that I am so glad we were called to take. While I am not the biggest fan of the jungle, and the jungle definitely doesn’t like me, it was an experience that created one of the best parts of our trip. Chase, having a biology major, appreciated it all the more. I think this was his favorite part of the trip, hands down. That ended our time in Peru, and we hopped on a 10 hour speedboat to Columbia. Goodbye, Peru. Thank you, Peru. It’s been quite the ride.